What lies within the fold of this spicebush leaf? 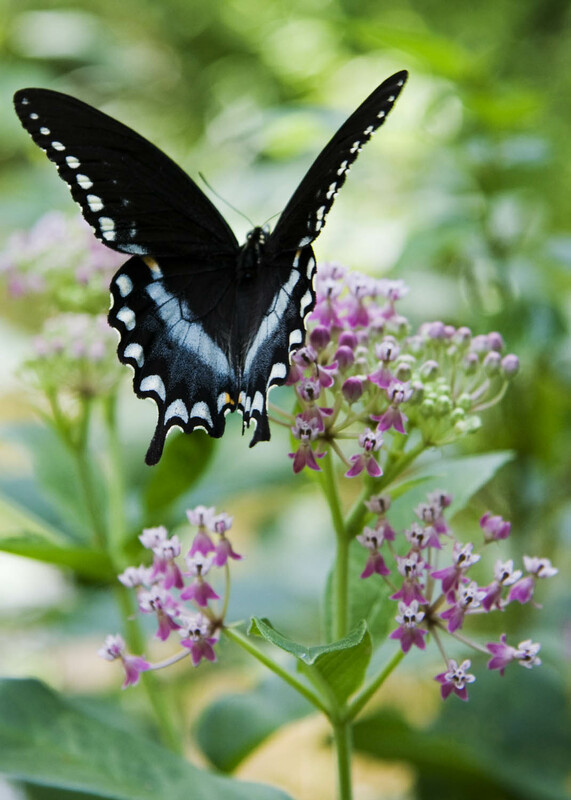 After writing this blog for over 5.5 years, my obsession should be apparent to everyone: I am endlessly fascinated by the natural world, especially the inhabitants of my five acres of green chaos in the piedmont region of North Carolina. Case in point? I’ve been unfolding folded leaves like the one above for years and years. Until a week or so ago, every time I unfolded the leaf, it was empty inside. But I persevered, stopping at every spicebush growing in my yard (a dozen or so), searching for curled leaves, and uncoiling them in the hopes of finding treasure within. Finally, last week, I scored. Isn’t it amazing? I think it’s so clever of Mother Nature to have had this caterpillar evolve large spots on its hind end. Most entomologists believe the coloration is supposed to make hungry birds think “Snake!” when they find it, and fly away. The caterpillars hide within coiled leaves by day and emerge to feed at night. 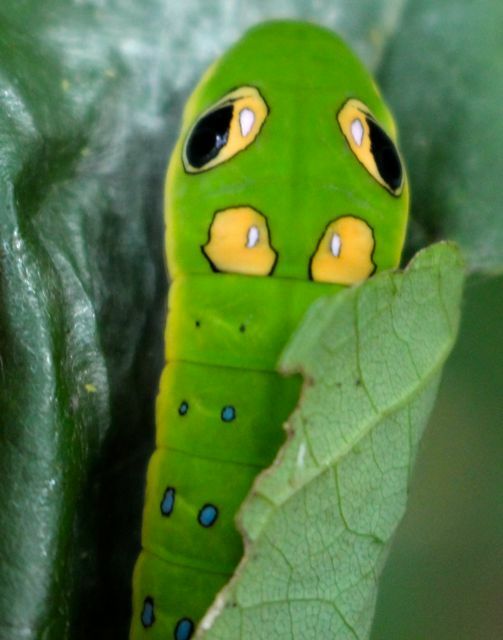 I knew the caterpillars were there, because I’ve seen many Spicebush Swallowtail butterflies in my yard this year — and many eaten spicebush leaves. But the caterpillars eluded me until now. 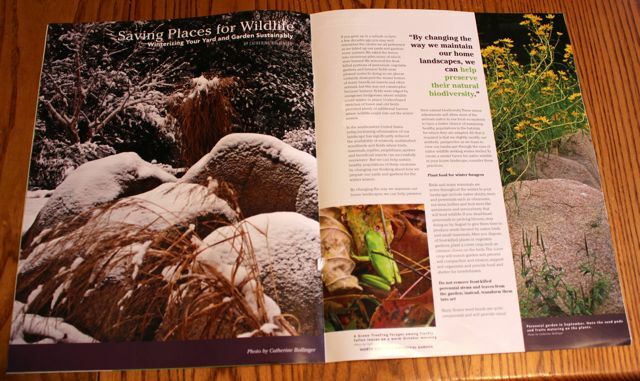 When I wasn’t hunting elusive caterpillars or admiring and photographing the numerous pollinators in my garden this summer, I’ve been writing a couple of articles for publication. 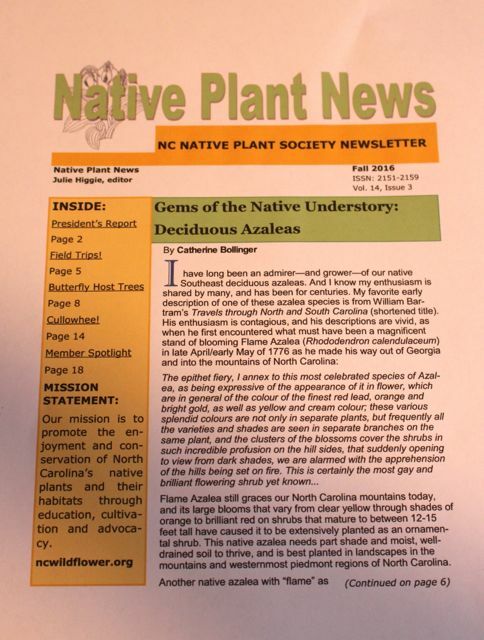 The editor of the NC Native Plant Society Newsletter asked me to write a piece on native deciduous azaleas for the fall edition. I was happy to oblige. 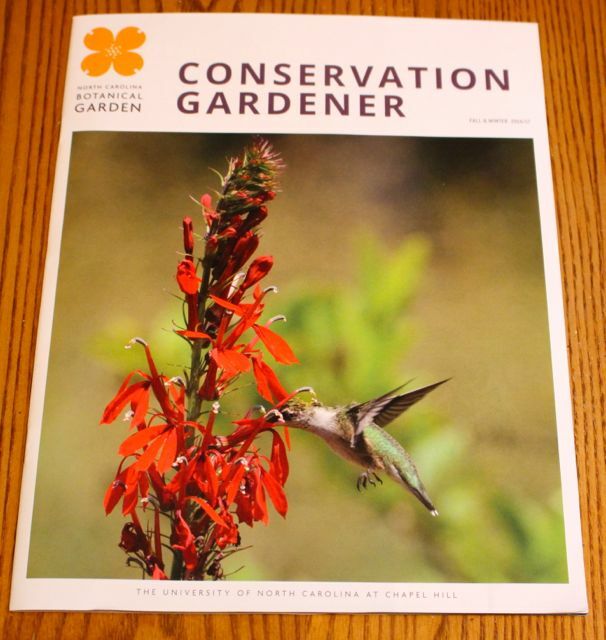 And the editor of the NC Botanical Garden’s magazine, Conservation Gardener, invited me to write an article for its second edition. The magazine is a benefit of membership, and I think the second edition is even better than the first one. This time, I was asked to write about winterizing our yards and gardens sustainably. I really enjoyed putting this one together, especially because I was able to interview several staff members at the NC Botanical Garden so I could share their ideas. If you click on the photos in this entry, you’ll get a larger version that will show a few more details. But I hope this may encourage gardeners in the southeastern US who are not yet members of the NC Botanical Garden to join. The new magazine is relevant to gardeners in the Southeast, even if you aren’t close enough to visit often. And membership rates include discounts for seniors, students, and volunteers. If you are close enough to visit, I hope I’ll see you this Friday, September 23, for Members’ Night of the NC Botanical Garden’s Fall Plant Sale. If you click on this link, you’ll see a link to a printable list of all the plants that will be for sale that evening. I’ll be stationed at a table handing out lists of suggested natives for various situations/growing conditions. All the plants on these lists will be for sale that evening. And don’t forget that as a member, you get a 10% discount on all your purchases. If you come to the sale, please stop by and say hello. This entry was posted on September 19, 2016, 5:19 pm and is filed under Conservation Corner, Favorite Plants, piedmont gardening. You can follow any responses to this entry through RSS 2.0. You can skip to the end and leave a response. Pinging is currently not allowed.